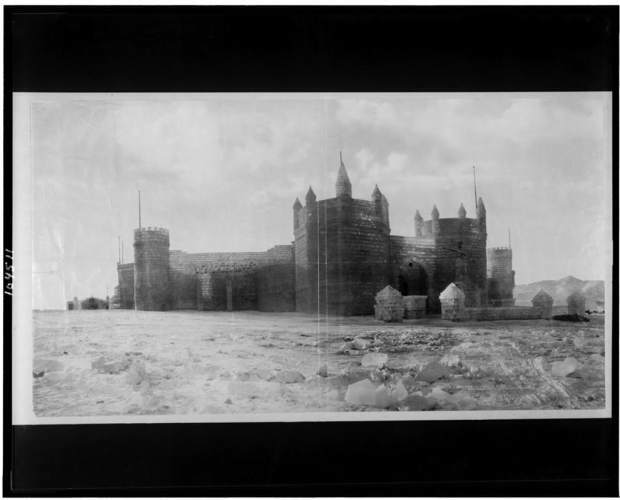 William Henry Jackson photographed the Leadville Ice Palace in 1896. It is cold enough this year to revive a temperature-dependent tradition, the fabrication of an ice palace. St. Paul, Minnesota, continued a tradition the city kicked off during the 1880s and raised a 70-foot high ice palace for its Winter Carnival this year. Before the advent of the electric refrigerator, mothers kept food fresh inside a kitchen icebox. Widespread use of these devices created a profitable business — ice for sale. The employment rotated with the seasonal demands of agriculture. St. Paul’s ice business harvested blocks from nearby lakes to cool refrigerated railroad cars. With ice blocks readily available, civic leaders with huge imaginations took on a notion to construct an entire building of ice. The frozen structure would house entertainment and skating, which would attract visitors from neighbor communities. The unique idea resembled construction of the ancient pyramids, yet on s much smaller scale, with blocks 22 inches by 32 inches by 18 inches. Despite their manageable size, the rectangular solids weighed in at 350 pounds. Imagine what it would be like to stack those frigid, slippery blocks to form a wall, or a spire! A wood frame supported the structure and the roof. St. Paul erected grand ice palaces. One built in 1888 reached 130 feet high with a 190-foot square base. The palace incorporated 55,000 blocks of ice. Daylight filtered through ice with a translucent quality, a special effect. Lit from inside, the palaces glowed in the dark. For whimsical effect, builders embedded a walleye fish in one of the blocks. Colorado can’t match Minnesota’s cold, but 2-mile high Leadville, “Cloud City,” comes close. In 1895, locals began to plan their own ice palace. They aspired to make some money and to attract attention to the thriving city. They hired an architect who had designed an early St. Paul ice palace, and began to raise funds for the expensive project. They timed palace construction for the January Cloud City Festivities, their winter festival. At the time, Leadville and Aspen competed to be known as the best silver city. Separated by only a few hours’ train ride, citizens of each city often traveled to their rival city to work and play. Baseball attracted crowds from the visiting city. Dance balls, concerts and boxing matches drew visitors. Rock drilling contests brought in the largest crowds. Each town’s top miners competed for a large purse and for hometown pride. So when Leadville planned their ice palace, they counted on visitors from Aspen as well as Denver. Competitive Aspen was too warm to compete. Although they harvested ice for local use, they lacked the extended cold required to prevent a palace from premature melting. Rather than create a rival project, Aspen’s residents took the low road: they ridiculed Leadville’s idea. Complicating matters, Leadville’s architect visited Aspen and pronounced the palace would be as big as an Aspen city block, then later — four blocks. Locals protested that with an architect like that, the project would flop. Ambitious indeed, Leadville’s palace housed a 16,000-square-foot ice rink. An additional 10,000-square-foot wood floor underlay a “big ball room, banquet hall, dressing and cloak room, and a kitchen — all covering three and a half acres.” The frame used 182,000 board feet of lumber. Six life-size ice sculptures of miners, a mining mogul and a queen decorated the exterior entryway. Aspen’s residents followed stories of the construction with disdain and chuckled at complications. Originally, completion was slated for Dec. 20. Delays moved the opening date to Jan. 1, then Jan. 4. For a while, cold weather hampered work. When The Aspen Times reported, “a letter received by an Aspenite says that Leadville ice palace workmen strike almost every day to secure wages due,” Aspen guffawed. Well into January, the palace opened and Aspen’s residents gulped their pride, on the rocks. They organized an excursion to Leadville, replete with Aspen’s city band to accompany their march from the train station to the palace. Between 300 and 400 made the journey on the Denver and Rio Grande Railroad, which offered an excursion fare of $3.45 ($88.50 in today’s dollars), which included two entry tickets. In all, thousands of visitors marveled at the chilly wonder. No matter how hot the business, it did not bring in enough cold cash to match expenses. Throughout the rest of winter, the railroads offered special rates on weekends, and Aspenites reveled in the once-in-a-lifetime experience. Even Leadville thawed come springtime, and enthusiasm to build another money-losing ice palace melted away.